Atacamaites are small tektite-like bodies. They are controlled by surface tensions, but compositionally they are not true tektites, instead representing a very proximal impact glass with great similarities to Irghizites, Lonar Crater Glass, Darwin Glass, Waber Glass. Koeberl (2019) confirmed this, remarking that the heterogenous nature and water content indicated they were proximal impact glasses. Five specimens of Atacamaites were discovered in 2012 by M. Warner and M. Warner. In 2013 they managed to recover 3,000 specimens in a 20 km2 area (Devouard et al., 2014). Subsequent fieldtrips by other parties have yielded many more specimens. According to Labenne labels Atacamaites are dated at 7 Ma, although nothing has been formally published. 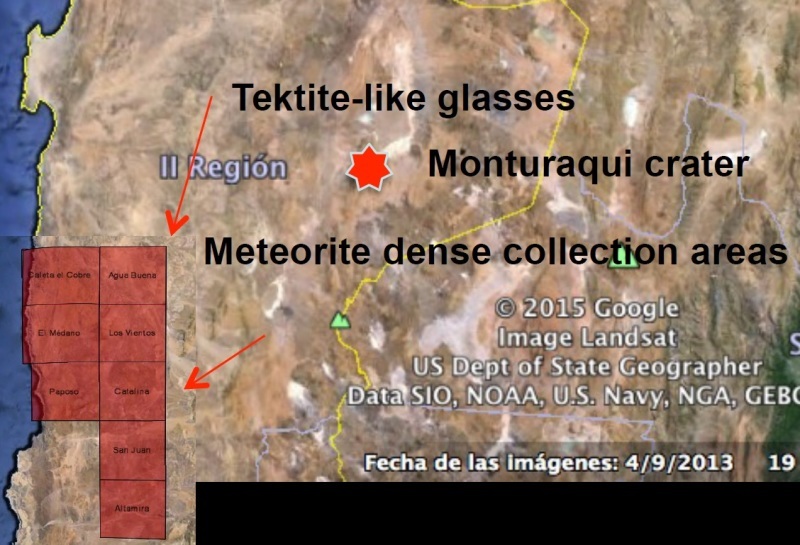 I knew Monturaqui Crater was in the general region and my immediate thought was that these specimens were related. However, Monturaqui Crater is under 1 Ma in age, so if ages are accurate then this cannot be the case. Koeberl (2019) indicates that the impactor was likely an iron meteorite. 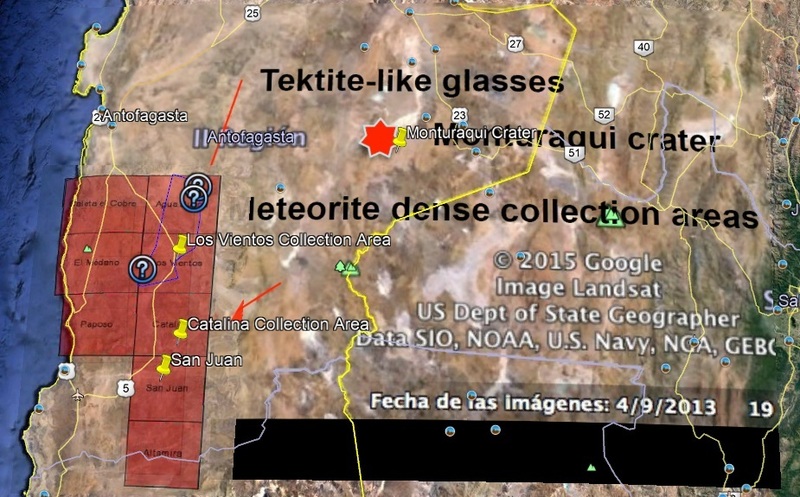 Atacamaites are a proximal impact glass, They were surely deposited within around 30 km of the impact site. 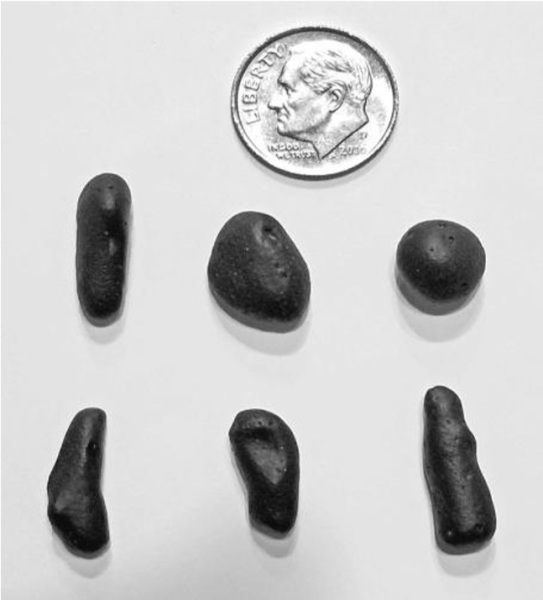 They are controlled by surface tensions like tektites but are more heterogeneous, contain a higher percentage of impactor and marginally higher percentage of water than tektites. The crater may no longer exist or may be buried. Atacamaites are a proximal impact glass and likely formed close to the source crater, probably within 25-30 km of the source. My guess would be that the impact crater(s) are likely small and within the range of 1 km (+/- 0.5 km diameter). Of course if these are 7 million years old, despite the dry climate, there would likely have been sufficient time to partially erode and bury / fill-in the crater. The biggest mystery of Atacamaites, however, is the source. In a stunning omission, unscientific in my opinion, the find localities have never been disclosed. It is believed that stricter meteorite laws will be introduced in Chile that will effectively end private meteorite collection (and with it likely curtail any significant scientific advances as they'll be in a position of literally a handful of people spending a week or two each year scouring a country of 756,950 km²). Hopefully laws will allow collection if finders contribute a percentage found, otherwise it simply means the meteorites will remain unfound or will be illegally exported over borders with all data lost. People collect meteorites for both scientific and monetary value, but without monetary value then they will not be found as there is a cost to finding them. In my opinion meteorite laws designed to protect science end up "cutting off the nose to spite the face". People know that classified meteorites are worth more than unclassified ones and therefore there is usually a strong degree of co-operation between dealers, hobbyists and scientists. Ultimately kids who are hobbyists become enthusiastic and can turn into scientists. When monetary value is artificially removed it simply means that the once valued item will be left unfound or it will be found and illegally smuggled over a border: Either way the specimen will be lost to science. Spending money to enforce meteorite laws is better spent providing laboratories and a public interface so that the meteorites are found and can be studied scientifically. Crater sites can and should be protected as sites of scientific interest. The balance has to be right though. So enough said on this controversial matter. 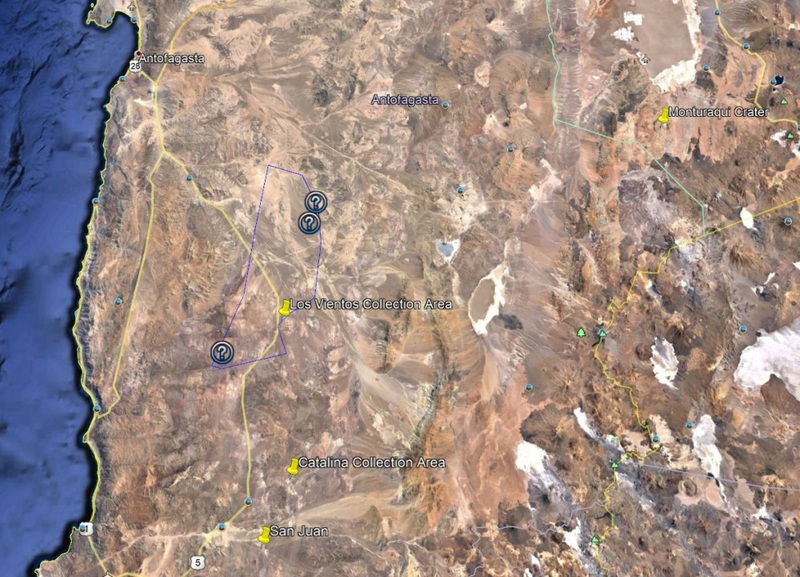 The fact is that the location of Atacamaites has been kept secret for 6 years, presumably until laws come in. What we do know is that at the time M. Warner and M. Warner found the tektite-like glasses they were actually looking for meteorites. They were therefore likely collecting in meteorite friendly terrain (flat featureless terrain with few dark rocks). A look at the Meteoritical Bulletin shows that in 2012 / 2013 Michael Warner recovered meteorites from the Catalina area (~25°14'S, ~69°43'W), Limón Verde area (22°35.813' S, 68°42.521'W) and the Los Vientos area (~24°41'S, ~69°46'W). Unfortunately and rather unsatisfactorily from a scientific perspective the find localities of individual finds are not given. Instead generic coordinates are given for all meteorites found in the general area. This is deliberately misleading in order to avoid disclosing find localities. The data is not reliable beyond indicating a general region. Next, in our quest to find the source locality of the Atacamaites Dr Millarca Valenzuela (2015) gives away the approximate location in a map. Now this map is not 100% accurate, in fact it is two maps that have been inaccurately overlain, but it gives a general impression of where things are found that is likely to have a degree of relative accuracy. It is important to publish the locality so that observations can be independently verified. It would also allow more researchers to study the area and potentially come up with a source crater. In science, sharing information helps us get to answers quicker. If locality was published then for sure some collectors would visit, but the remoteness combined by the generally low demand for tektites means that this would probably not have a hugely significant impact on the site. ABOVE: The map placed on Google Earth. I re-positioned the map with red areas as it was superimposed incorrectly. The arrow indicating a meteorite dense area points broadly to the Catalina collection area. The arrow for Tektite-like glass (i.e. Atacamaites) is in the Agua Buena area, pointing towards Los Vientos. It's roughly this area that we should likely be looking at for the Atacamaite occurrence. One can eliminate the high ground and focus on flatter plains. There is likely a circular feature nearby - three such possibilities are offered (?) but are likely not depressions but hills. So I would be focusing my search in the blue area. I might be wrong - the occurrence could be a little further afield but I think I'm broadly in the right ball-park. I'm sure that by asking around you could close in on an area. ABOVE: The blue line area is where I would start my search (especially the NE part) and then move out. Certainly we are broadly in the right area for Atacamaites. They are likely at Los Vientos +/- or slightly to the north.